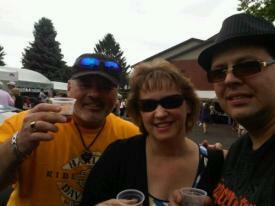 Fritz tips some Jager with his cousin, Lori Rook and her husband, James on June 26th during FPB's gig. Mike poses here with his newest fan during FPB's gig in Auburn, NY on June 26th after Mike gave his personalized FPB drumsticks to the kid. A groundview perspective of Gabe jamming on June 26, 2011 in Auburn, NY. Fritz and Rocko have tip some Jager punch with some friends during FPB's gig on June 26th. Mike enjoys some Jager punch with FPB Fan Club Members, Kay and George Misnick during FPB's June 26th gig at St. Hyacinth Picnic. Members of Fritz's Polka Band along with special guest, Rocko Dorsey enjoy a little Jager punch with some friends in Auburn, NY on June 26th. Fritz's Polka Band with their great friend, Rocko Dorsey (special guest on a few tunes) after their first set on June 26, 2011 at St. Hyacinth Picnic in Auburn, NY. Frank, Mike, Rocko (special guest) and Fritz are shown here as FPB finishes up their first set of June 26th with 'Johnny B. Goode'. Fritz and Gabe with special guest, Rocko Dorsey on June 26th. Tom and Fritz during FPB's gig on June 26, 2011. Mike and Gabe on June 26th. Tom, Frank, Fritz, and Mike on June 26th. Frank and Mike on June 26th. Frank, Fritz, and Tom on June 26th. Mike during FPB's gig at St. Hyacinth Picnic on June 26, 2011 in Auburn, NY.